1. What type of files can I upload for my foil stamped business cards? We prefer that you send .PDF and .EPS files with outlined fonts. These files are easier to handle and will likely speed up your turn-around. Remember to add crop marks and flatten your business card files before uploading. 2. What color mode should my foil stamped business cards be? If you send us an RGB file for your foil stamped business cards, there is a chance that a color shift may occur and you may not be satisfied with your job. You should always start and finish your business card designs in CMYK color mode. 3. What resolution should my foil stamped business cards be? All files should be 300dpi. Any low resolution files for foil stamped business cards will be placed on hold until we receive new files, slowing your turn-around. 4. How should i set up my bleed and crop marks for foil embossed business cards? 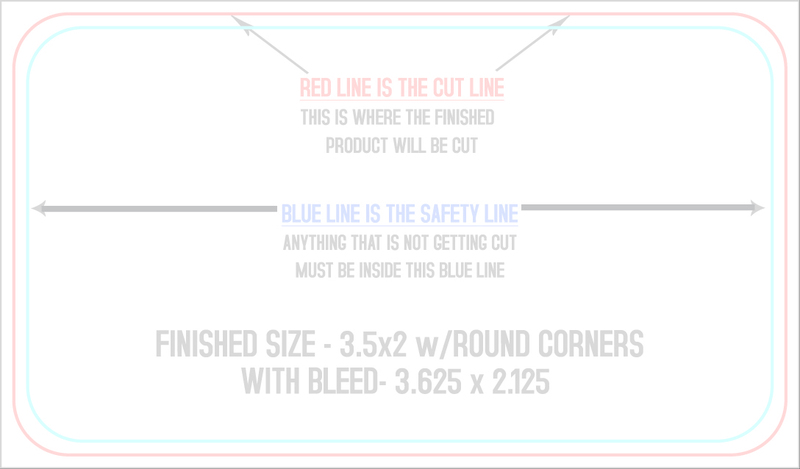 Bleed must extend further than the cut line. Using one of our business card templates can help you visualize this. 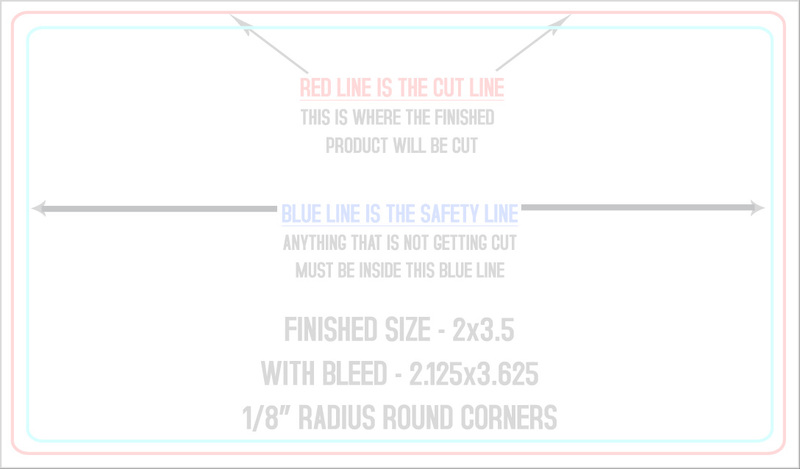 Please keep all text and anything you do not want cut at least .125" away from the cut line. 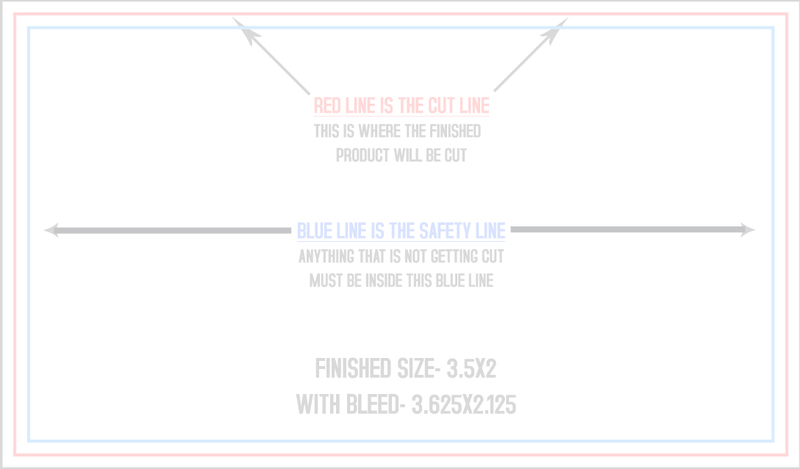 When sending an .eps or .pdf, make sure you include crop marks so we can cut the job correctly. 5. How should I set up my artwork files for Foil, Embossed, Die Cut, Spot UV etc.? When you are printing with any extra options such as spot uv, foil stamping, die cutting, or embossing. You must include a separate template file along with the regular full color file for each extra option that you will be applying. All of these options will require the same type of setup file. Please use only black (set as C=0, M=0, Y=0, K=100) to indicate where you would like that option to be applied, and the white area will be left alone and nothing will be applied there. So for each file that contains your artwork, you would create a corresponding file that contains ONLY black and white to display where you want that finish or option to go.